I’ve heard people say things like what can you do with a pony or ponies are for kids. I’m here to tell you that they are not just for kids as I am seeing a trend of Baby Boomers getting ponies as they are easier to handle, cost less to feed, can be kept in a smaller area and when riding they are closer the ground. There are several events that adults can compete in with ponies and have a great time. 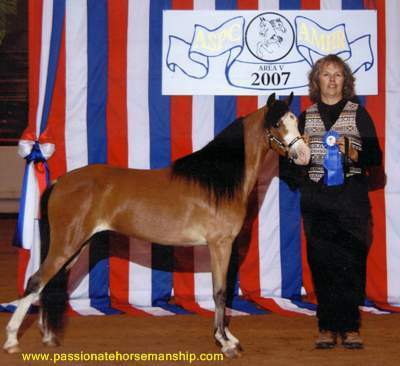 I know of a 13.1 Welsh pony (Flying Diamond The Bailef) that has competed successfully with an adult in the Extreme Cowboy Race, is a National Champion Hunter, National Champion Western Pleasure Pony, has wins in ACTHA and Dressage. There are several adults showing ponies successfully in the show ring from the In-Hand events like Showmanship, Hunter, Jumper, and Trail. If you would like to learn more about ponies and how you can get involved with them contact me today as I can help you find the pony of your dreams. I train miniatures and ponies plus I give lessons, clinics and offer online classes.